Derry City manager Kenny Shiels will watch tonight's game from the stand, as he serves a one match suspension. Derry City boss Kenny Shiels is hoping his remarkable winning run over Bohemians continues at the Brandywell tomorrow night (KO 7.45pm). Shiels has defeated Keith Long’s side an amazing 10 games in a row! “You wonder how long that’s going to last, because you have won 10 out 10,” he asked. Despite their unbelieveable record against the Dubliners, Shiels knows his side are coming up against one of the in-form teams in the league. The Gypsies, who know if they manage to secure the victory on the road they would move just two points behind the Candy Stripes, have won five of their last six outings, scoring an impressive 21 goals in those games. 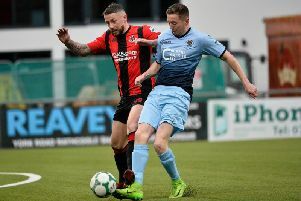 “Bohs have an abundance of talent and they have won five of their last six games,” he added. The Brandywell men’s league form in recent months has been shocking, as they have only amassed 13 points from a possible 48 on offer and Shiels knows his side need to start getting some consistency into their game. as they look to try and catch fourth placed Shamrock Rovers, who had a fantastic last minute win at league leaders Dundalk in mid-week. “It’s a big ask but Shamrock Rovers have to come to us so who knows?,” added Shiels. “It’s outside our control. If we can beat Bohs then we must wait and see how other teams above us do. “Yes we need to get more consistency, but people have knocked us because we have had a really difficult season and the boys have done well. Dean Shiels and Ally Roy, who picked up foot and collarbone injuries respectively in last week’s game against St Patrick’s Athletic may be available for selection, but midfielder Nicky Low and defender Conor McDermott are expected to miss out again. Shiels also confirmed that the club are in on-going contract talks with most of the squad. “Talks have been ongoing for quite a while now and I’m trying to get players to extendtheir contracts,” explained the Derry boss.